Wahoo! 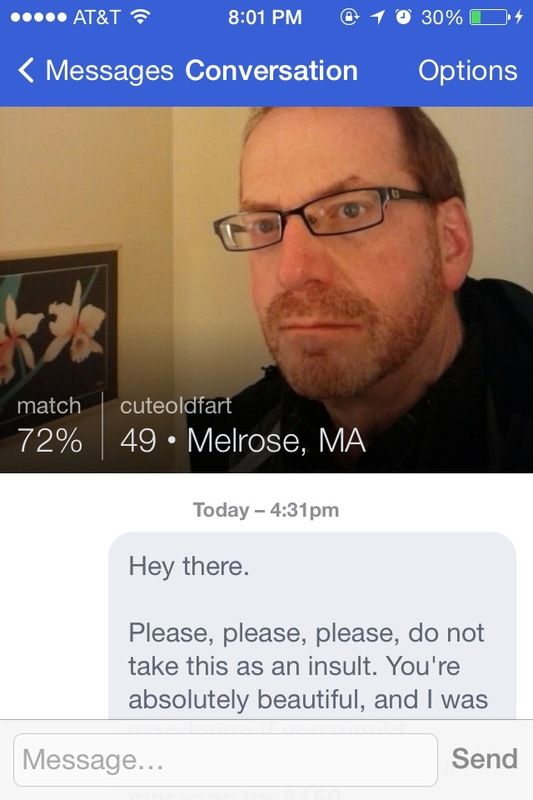 Another installment of the horrifying messages I receive on OkCupid and other dating sites! Let’s get right to the nitty gritty, why don’t we? I am a little older so if you would like to chat, cool. MEH. No where in my profile does it say I want to be hit on by men almost twice my age. GO AWAY!!! And also, one time what?? Is that the beginning of a story or the amount of times he’s been successful at hitting on a girl? How do you know you like me, Patrick? Bonus points for not blatantly hitting on me but are you really on this site to be friendszZZSssZZSszzssSSZ? Hi. I just joined this app today and wanted to have a friendly chat. I saw your profile and you look a amazing person to me. If you do not mind let’s have a friendly chat. they are many girl here on this app. when people see then they go crazy. but to me only you are the most beautiful girls. when i see your eyes i think they are looking inside my soul. your hairs are so pretty. Hmm ok where do I start? 20 years old and from Pakistan?? How is that even remotely supposed to work out even if he happens to be a normal non-psychopathic human? Sure… friendly chat? Is that what we’re calling it now? Also, the thing about my eyes scares me. Is that a compliment? Or does that make me kind of demonic? And thanks CoolPerson1238, I think my hairs are nice too. Hey Abby! How is it going?I don’t usually message people but you are totally worth it. I had a constant smile while reading through your profile. I would like to share my world with you. I like to express my feeling both with words and gifts plus free dinner on weekends!! Hurry offer lasts for limited time only. Okok I see you. Points for trying to use a Taylor Swift pick up line. Hey your beauty makes the morning sun look like the dull glimmer of the moon. how’s it going? Whoa whoa whoa, tryna pull out all the stops eh? But why are you messaging me from California? Are you my future best friend ? No? I don’t think so? Please, please, please, do not take this as an insult. You’re absolutely beautiful, and I was wondering if you would consider giving me a 1 hour massage for $150. I feel horribly asking you. I’d be happy to treat you to some lunch, dinner, a coffee, whatever first so you can meet me and decide. No pressure, no commitment. What does beauty and needing a massage have anything to do with one another? UGH SUCH A CREEP. If you feel horrible asking me, then WHY did you ask? NO NO NO NO NO! Here’s some pictures for your viewing pleasure since I was smart enough to screenshot the message before he disabled his account! So that’s all for now! As always, I’ll post again once I get even more gems! Maybe one day a nice, NORMAL boy will message me. But until then, I’ll keep posting the weirdo ones here. Giggle away, friends! On Food for Thought Thursday, I write about Baker Pet Peeves so come back and check it out then!